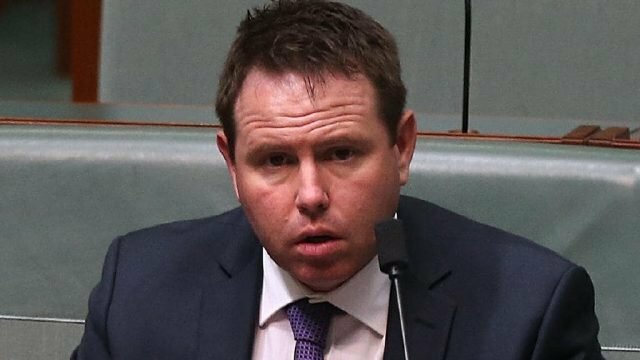 It took disgraced Nationals MP Andrew Broad 24 hours after the “sugar baby” story broke to announce the inevitable – that he won’t re-contest his Victorian seat of Mallee. They do things slowly in the Nationals. In McCormack’s case, at glacial pace. The Nationals leader’s handling of the Broad scandal has been appalling. His failure to instantly inform Scott Morrison of a potentially explosive situation (the Prime Minister only learned of it on Monday) is inexplicable, and must severely strain the relationship between the two men at the top of the government. McCormack on Monday muddled his account, saying he had only been told “a couple of weeks ago”, when he urged Broad to go to the police over the actions of a woman he met on a “seeking arrangement” website. McCormack’s timetable was blown out of the water within hours by an Australian Federal Police statement that said Broad had referred the matter to it on November 8. On Tuesday, McCormack’s performance was extraordinary. He hadn’t informed Morrison at the start because “I don’t tell the Prime Minister everything about every member of parliament. He’s got enough on his mind at the moment. Asked whether he wanted Broad to run for Parliament again, McCormack blathered rather than just saying “No”. Any diligent leader would have got to the bottom of the matter at once, extracting the full picture from Broad. Any prudent leader would have briefed the Prime Minister without delay. Any savvy leader would have known the scandal was likely to leak and that, anyway, Broad’s behaviour showed he was in an untenable position. McCormack must live in some parallel universe if he ever thought his assistant minister’s account of flying off on an overseas date, which resulted in an apparent move to blackmail him, was just “a personal matter between him and his family”. Nationals deputy leader Bridget McKenzie said in a statement late Tuesday: “The Nationals are not a party where this standard of behaviour is acceptable”. Yet McCormack kept Broad on as his assistant minister for weeks. And in his Monday morning statement announcing Broad had resigned from the frontbench, the Nationals leader said Broad “will continue as an effective and hardworking Member for Mallee”. McCormack’s leadership is only secure because we are so close to an election. He was already under criticism from within his party and his conduct over Broad might have brought on a challenge in other circumstances. The Nationals, supposed to be a party of family values, have bookended the year with two personal scandals. Barnaby Joyce’s affair with his former staffer, now mother of his son, distracted the Coalition in the early months. How the Morrison government’s grand tactical plan to overshadow Labor’s national conference went awry! The big story about a surging budget position, promising dollars for tax cuts, was expected to dominate the news. As things turned out, the government did squeeze out the Labor coverage – but for the worst of reasons. Labor’s management plans, in contrast, went as smoothly as clockwork. Tricky issues, notably border security, were stitched up. Potentially controversial polices, including how broadly a Labor government would allow industry-wide bargaining, have been left for decisions by the leadership later. Even what seemed the risky course of having Kevin Rudd address the conference – as a gesture of reconciliation and party unity – played out without a hitch. A raid on New South Wales ALP headquarters in Sydney in pursuit of an ICAC investigation into donations was embarrassingly timed but didn’t threaten the narrative at the conference in Adelaide. The conference was used as a platform for announcements – on housing affordability, the protection of superannuation, the environment, reconciliation, refugees, the pursuit of gender pay equality. There were few votes and only one of them, on a left proposal for a human rights charter, involved a count – the left narrowly lost. Controversy over signing up to a nuclear weapons ban treaty, on which Anthony Albanese and Penny Wong have different views, was defused by wording that leaves plenty of latitudes. One significant proposal that was passed calls for a Labor government to recognise Palestine, something that various state conferences have been urging strongly. The role of the unions was proudly acknowledged. The ACTU secretary Sally McManus told the conference: “The trade union movement is the early warning system for this nation. We are the earthquake sensors in the ocean that feel the tremors before they reach the shores. We are the smoke alarm trying to wake you from your deepest sleep. The siren that makes you look up before it is too late. It’s notable that in the election for the ALP national executive, the CFMMEU has gone from one representative to two. Its national secretary, Michael O’Connor, is now a member of it. The conference has left open how much the unions will get as Labor unveils more detail of its industrial policy over the coming months.